The items on this page are treasures from history that have found their way into the pages of my books. Each artifact has a long and varied history. What I have tried to present here is a brief explanation of each piece along with links to help you further your own exploration into these treasures from the past. The Stone of Destiny is featured in the book, The Warrior Trainer. Legend tells us that the Stone arrived in Albania through the bloodline of a warrior known as Scotia. The Stone was moved many times in order to keep it safe. It is said to have resided on the Isle of Iona, then Dunadd where it was used to inaugurate the High Kings. In the sixth century, the Stone was moved to a fortress named Dunstaffnage. In the ninth century, the Stone was moved again, to protect it from Viking raiders, to the Abbey of Scone and was used for the inauguration of the Scottish kings. At this point in history the Stone of Destiny became known as the Stone of Scone. In 1296, Edward I of England stole the Stone and placed it under the throne in Westminster Abbey where the English kings were crowned. Some say the Scots knew Edward was coming, and that the monks of Scone hid their precious stone, replacing it with a lump of common sandstone. The real Stone was said to be composed of black marble with intricate carvings in the shape of a seat. The current Stone is reputedly of sandstone with no markings. It has been theorized that the original stone remains hidden in Scotland and is kept safe by a secret society. 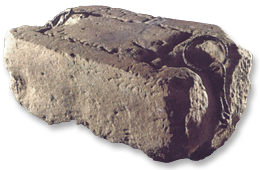 The Stone of Destiny was returned to Scotland in 1996 in preparation for the 1999 re-establishment of the Scottish Parliament. Real or false, the Stone of Destiny is regarded as a national treasure by the United Kingdom governments. Today, it has a place of honor within the Throne Room of Edinburgh Castle. However, it still remains the property of the English Crown and will be returned to Westminster for any future coronations. The destiny stone featured in Warrior’s Bride was a real stone that did not have a name. As legend has it, a seventeenth-century visionary named Cùinneach Odhar (Kenneth MacKenzie, from Uig on Skye), who was referred to as the Brahan Seer, used a small white divination stone to foretell the future. The stone was passed on to him from his mother who acquired it from a Viking princess. With the pebble pressed against his eye, Cùinneach foretold everything from outbreaks of measles in the village to the building of the Caledonian Canal, The Clearances and World War II. His visions brought him widespread fame, but it also resulted in his untimely death when the Countess of Seaforth summoned him after her husband was late from a trip to France. Reluctantly, he told the countess that he saw her husband in the arms of another woman. At this, she flew into a rage, and ordered him to be thrown head first into a barrel of boiling tar. Before his execution, which took place near Brahan Castle on Chanonry Point, Cùinneach made his last prediction: when a deaf and dumb earl inherited the estate, the Seaforth line would end. His prediction finally came true in 1815 when the last earl died. Warrior’s Lady features a famous Scottish amulet called the Lee Penny. For the purposes of the story, I renamed the amulet The Charm Stone. The Lee Penny was obtained by the Locard family during the Crusades in 1330. During a decisive battle, Sir Simon Locard (whose name was changed to Lockhart after this battle) captured and imprisoned a wealthy emir. When the prisoner’s aged mother came to pay his ransom, and in the course of counting out the money, a pebble inserted in a coin fell out of the lady’s purse. She was in such a hurry to retrieve it that the Scottish knight realized it must be valuable and insisted that the amulet be added to the ransom. The lady reluctantly agreed and explained what virtues the stone possessed. 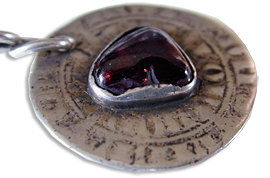 The stone was a medical talisman believed to drive away fever and stop bleeding. 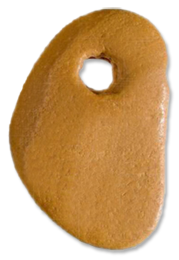 The amulet was used frequently in the past, according to tradition. In 1629 the Lee Penny was used to cure sick oxen, but as a result a young woman was burned at the stake for witchcraft for using the stone. There are records of an accusation of witchcraft against Sir Thomas Lockhart during the Reformation, but the Church Synod at Glasgow merely reproved Sir Thomas and advised him to cease using the stone. During the reign of Charles I, the citizens of Newcastle, England requested the use of the Lee Penny to cure a cattle plague. In order to guarantee the stone’s return, Sir James Lockhart required a bond of 6,000 pounds. The penny was used, and the plague abated. Many cures for both animals and humans, directly related to the use of the Lee Penny, are recorded through the middle of the nineteenth century. The Lee Penny is the most widely know of all the Scottish amulets thanks to Sir Walter Scott’s The Talisman that also features the mystical stone. In the pages of To Tempt a Knight, the Templar artifact the hero and heroine struggle to protect is the Longinus Spear, also known as the Spear of Destiny and the Holy Lance. At the crucifixion of Jesus Christ, the Spear was in the possession of the Roman Centurion Saint Longinus. It was Longinus who pierced Christ’s side with the Spear. Eventually the Spear fell out of Longinus’ care and into the hands of destiny. Among those who are alleged to have possessed the Spear at one time or another are: Boadicea; Herod the Great; St. Maurice of the Theban Legion; Constantine the Great, who carried the Spear into victory at the Battle of Milvian Bridge and also while surveying the layout of his new city, Constantinople; Theodosius; Alaric, who sacked Rome; Theodoric, the only man to force Attila the Hun to retreat; Justinian; Charles Martel, grandfather of Charlemagne; and Charlemagne the Great, who carried the Spear through forty-seven victorious battles, but died when he accidentally dropped it. In early 900 AD, the Spear fell into the possession of the Saxon Dynasty of Germany, passing from Heinrich I, who was victorious in his battle against the Magyars, to his son Otto I, who carried the Spear into victory over the Mongols in the Battle of Leck. After the death of Otto I, there are conflicting stories of what happened to the Spear. Eventually, it fell into the possession of the house of Hohenstaufen. Napoleon attempted to seize the Spear after the Battle of Austerlitz, but it had been smuggled out of Vienna just prior to the battle. In the early 20th century, the Spear was briefly in the possession of Kaiser Wilhelm, before eventually ending up in the Hofsburg Treasure House in Vienna. It was there, in September of 1912, where Adolf Hitler first laid eyes upon it. Adolf Hitler seized the Spear in the name of the Third Reich on March 12th, 1938, the day he annexed Austria. During the final days of the war in Europe, at 2:10 PM on April 30th, 1945, Lt. Walter William Horn, of the United States 7th Army, took possession of the Spear in the name of the United States government. Within ninety minutes of the United States capturing the Spear, Adolf Hitler committed suicide. Generals Eisenhower and Patton decided to return the Spear to the Royal House of Hapsburg shortly thereafter. The Spear can currently be found at the Schatzkammer of Vienna. There are several Spears that claim to be the “true” Spear of Destiny. In addition to the Vienna lance, another lance discovered during the First Crusade exists in Echmiadzin, Armenia. St. Louis brought another Spear to Paris, following his return from the Crusades in Palestine in the 13th century. Another lance, known as the Vatican lance, was sent to Pope Innocent VIII by the Ottoman Sultan Bajazet II in 1492. Some medieval scholars believe that this lance is truly the Echmiadzin lance that fell into the hands of the Turks, and eventually made its way to Bajazet, who sent it to Pope Innocent. The Vatican lance is encased in one of the pillars supporting the dome of St. Peter’s Basilica. 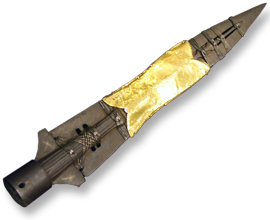 Another Spear is kept in Krakow, Poland and is believed to be a copy of the Vatican lance. The hero and heroine of Seducing the Knight search for the legendary Ark of the Covenant. In biblical history, the Ark was where God manifested His presence on earth. The Ark went ahead of the children of Israel wherever they traveled. Not only was it the center of worship when it resided in the tabernacle, but the Ark also protected the Israelites in battle, supernaturally defeating any adversaries that came before them (Joshua 6:3-4). The Israelites also went to the Ark to seek God’s guidance and wisdom for the nation (Numbers 7:89, Exodus 25:22). But the Ark of the Covenant is also one of the most frightening artifacts described in all of Biblical history. A golden box with the power to strike men dead, to the ancient Hebrews the Ark was both a divine manifestation and a talisman so powerful that they carried it with them into battle. To their enemies, it was a treasure to be coveted, but once captured, a terrible punishment. It came to occupy the most revered spot in Jerusalem, the Holy of Holies at the Temple of Solomon, and then it mysteriously disappeared. Where the Ark went has been the subject of much conjecture over the centuries. Many theories exist: In 586 B.C., the Babylonian emperor Nebuchadnezzar II sacked and destroyed the First Temple of Solomon in Jerusalem, as a prelude to enslaving the Hebrews. But in the detailed biblical list of all the spoils the Babylonians took back with them to their homeland, the Ark is not mentioned, which suggests to some that by then it had already disappeared. Another theory surrounding the Ark’s disappearance from the Temple is that it had been smuggled out of Jerusalem prior to the Babylonian conquest, and spirited away by Solomon’s son Melenik, the founder of the Ethiopian royal dynasty. Melenik was supposed to have brought the Ark with him upon returning to the Ethiopian homeland of his mother, the Queen of Sheba. Today, Ethiopian Orthodox Christians believe the Ark resides in the Church of Saint Mary of Zion in Axum. The sanctum where the Ark supposedly is kept is guarded by a priest, and no outsider is allowed to enter, so the claim is impossible to substantiate. Based on ancient Jewish writings, some have suggested the Ark is hidden on Mount Nebo on the Jordan River’s east bank. This site is presently in the modern nation of Jordan with no hint of the Ark’s presence. Others suggest the Ark is hidden somewhere near the Dead Sea, on the Jordan River’s west bank. This location is usually considered in association with the ancient site of Qumran and the people of the Dead Sea Scrolls. Here, the Ark and other artifacts are believed buried in one of the region’s caves, like the Dead Sea Scrolls. Another view suggests the Ark is located beneath Jerusalem, in a stone-carved tunnel. Some say it is beneath the suggested site of the Crucifixion, Gordon’s Calvary. The Temple Institute in Jerusalem’s Old City, an Ultra-Orthodox organization dedicated to rebuilding the Jewish Temple, says the Ark is under the temple mount and will be revealed when the new Temple is rebuilt. The hero and heroine of A Knight to Desire search for the sacred object known as the Holy Grail. 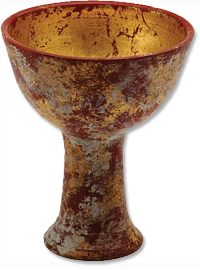 The Grail is most often identified in literature and certain Christian traditions as a dish, plate, cup or goblet used by Jesus Christ at the Last Supper, and said to possess miraculous powers, especially those of healing. The connection between the Grail legend and Joseph of Arimathea dates back to the twelfth century poet, Robert de Boron’s work, Joseph d’Amathie, in which Joseph receives the Grail from an apparition of Jesus Christ and sends the holy vessel with his followers to Great Britain. Building upon this theme, later writers recounted how Joseph of Arimathea used the Grail to catch Christ’s blood while on the cross. In order to preserve such a sacred vessel, Joseph was said to found a line of guardians in Britain to keep the Grail safe. The quest for the Holy Grail is another facet of historical legend that has since become associated with Arthurian legend. The Grail quest first appears in works by author Chretien de Troyes, who combined Christian lore with a Celtic myth of a cauldron endowed with magical powers. 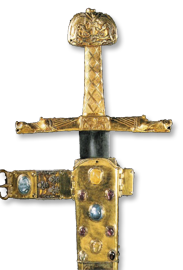 A Knight to Desire also features one of the world’s most famous swords—the sword of the great Emperor Charlemagne. Joyeuse is the traditional coronation sword of France. The name of the sword translates to “joyful”. Legend claims that the sword was forged to contain the Lance of Longinus within its pommel, others state it was supposedly smithed from the same materials as Roland’s Durendal and Ogier’s Curtana, other legendary swords. The sword was alleged to have been interred with Charlemagne’s body, or contrarily to be held in the Saint Denis Basilica, where it was later retired into the Louvre after being carried at the front of coronation processionals for French kings. Another supposed Joyeuse is held at the Imperial Treasury in Vienna.